The Bucket, a local burger restaurant that had previously closed down in 2013, reopened Oct. 29 on Eagle Rock Boulevard. 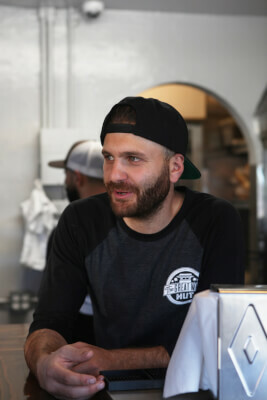 The burger joint originally closed because of a lease dispute between the owner of the building and the previous owner of The Bucket, George Eckley. The current owner, Rafi Pogosyan, wanted to reopen The Bucket so that the community could once again have a local restaurant. The public, according to Pogosyan, responded well to the reopening. 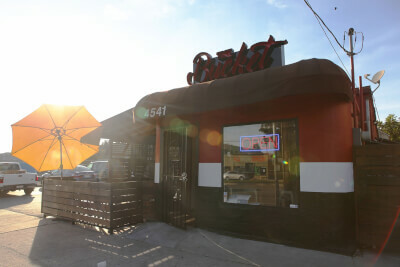 Although Eagle Rock resident Matt Harrington has not eaten at The Bucket yet, he said that the few people that he knows that have been to the new Bucket described the food as good but missed some of the classic sandwiches and burgers that the old Bucket offered. Before the new owners opened The Bucket, it was referred to as Patio Burgers and Beers, according to Harrington. The Patio, according to Harrington, was often hard to go to because it was rarely open and did not allow dogs. However, The Bucket now allows dogs on the patio, according to Harrington. The new owner, Pogosyan, explained that he is now one of five owners of The Bucket. 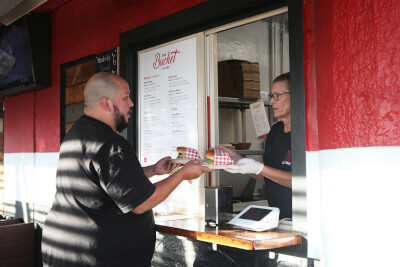 Pogosyan and the other owners also own both locations of The Great White Hut, which is a local chain of burger and taco stands in Glendale. The Bucket dates back to 1935 and has gone through various owners, according to Pogosyan. He said he got involved in the ownership change because he and the other five owners heard that The Bucket was being sold and wanted to revive a local staple. The Bucket’s new ownership wants to both please Eagle Rock residents who have fond memories of the original restaurant and remain true to their own ideas and recipes. One example of a new dish for The Bucket is the fritas, according to Pogosyan. He described the fritas as french fries with a choice of toppings including avocado, egg, jalapeño, carne asada, cheddar and feta cheese. The fritas are a signature of the new owners that can also be found at both Great White Hut locations. According to Pogosyan, the goal of reopening The Bucket was to bring back staples of the community that local Eagle Rock residents want. He said he is hoping that The Bucket will bring back some old-school energy into the community again. There have been many renovations — such as large apartments — to the Eagle Rock community that have been casting a shadow over the old gems, according to Pogosyan. “Everything is kinda changing and we’re trying to bring back the old-school vibe,” Pogosyan said. Pogosyan said he wants to bring back the history that The Bucket evokes in the local residents of Eagle Rock. Harrington said he is excited to go to The Bucket soon to enjoy a burger on the patio with his dogs. He said that he is glad there is now a good burger place in the neighborhood, describing many of the other burger restaurants in the community as overrated.